The crime branch of the Delhi Police today claimed to have arrested a relative of the head of the militant outfit Babbar Khalsa International and an NRI who was planning to whisk him out of the country. After the Supreme Court notice, seeking the Centre’s comments why the post of Chief Justice has been vacant in Patna High Court for nearly a year, the Union Government today announced the appointment of Mr Justice J. N. Bhat from Gujarat High Court to the post while stating that the vacant posts of judges in the High Courts of Punjab and Haryana and Madras would be filled up soon. In a bid to effectively check regrouping of major militant groups like ULFA and their efforts to establish cross-border linkages with other rebel groups, the Centre today decided to have a joint intelligence sharing mechanism with four North-Eastern states. Public sector owned coal companies CIL and SCCL today signed a wage agreement with trade unions that will pass on Rs 8,700 crore to over six lakh workers with over 60 per cent rise in their basic salaries. The CPI(M) politburo member, Mr Sitaram Yechuri, MP, said here today that they had issued a three-point guideline to the Prime Minister, Dr Manmohan Singh, on his meeting with the US President, Mr George Bush in New York , which he hoped Dr Manmohan Singh would follow in the larger interest of the country and the UPA government’s stability. Prime Minister Manmohan Singh will head a five-member National Disaster Management Authority (NDMA) to prepare a comprehensive plan and lay down the guidelines for central ministries and state governments to put in place disaster management measures. Union Defence Minister Pranab Mukherjee today said the infiltration of militants, two days ago, proved India’s contention that the infrastructure for sending infiltrators was still intact in Pakistan. The Union Government has decided against notifying the controversial amendments made in the Code of Criminal Procedure (CrPC) over which lawyers in the country had launched an agitation, stating that it would not be done till the matter was fully examined. A Division Bench of the Madhya Pradesh High Court has stayed the shifting and disfiguration of the property of the now-closed pesticide plant of the MNC Union Carbide Corporation (UCC) at Bhopal. Seher, starring Arsahd Warsi and Mahima Chawdhary, to be released by July end. They were identified as Dilbagh Singh, alias Bagga (37), and Surender Singh (50). Joint Commissioner of Police (Crime) Ranjit Narayan said Dilbagh, brother of Germany-based BKI leader Satnam Singh, had allegedly supplied four consignments of arms, ammunitions and explosives to Jagtar Singh Hawara, the prime accused in the blasts case, who was arrested earlier. Satnam Singh is the son-in-law of Wadhawa Singh, the chief of the BKI presently believed to be in Pakistan. Mr Narayan said both Dilbagh and Surender Singh, a non-resident Indian settled in Kenyan capital Nairobi, were arrested near the booking counter of Old Delhi railway station last evening. 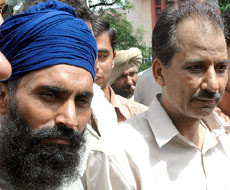 He said Surender had been contacted by Satnam through one Ranbir Singh, based in Spain. He had been promised 60,000 Deutsche Marks (Rs 14 lakh) and a return ticket from Kenya to India for taking Dilbagh out of India. “After the arrests of Hawara and other BKI operatives, the militants seem to have panicked and become desperate. That is why they are trying to take their people out of the country,” Mr Narayan said. Nearly 30 BKI militants have so far been arrested, mostly in Delhi and Punjab, since the May 22 blasts in Liberty and Satyam cinema halls here in which one person was killed and over 50 others injured. These include the four men who had triggered the blasts. Dilbagh, a resident of Mallian village in Amritsar, had come to Delhi along with Surender to arrange passport and visas. He was to be taken to Germany via Kenya, apparently to reunite with his brother there. Mr Narayan said Dilbagh had received arms, ammunition and explosives from BKI leaders and then delivered at least four consignments to Hawara and his associates Paramjeet Singh Behora and Jagtar Singh Tara to revive the network of the outfit in India. Law Minister H. R. Bharadwaj told reporters here that a notification had been issued for appointing Justice Bhat as the Chief Justice of Patna High Court, following the approval given by President A.P.J. Abdul Kalam. He claimed that there was no delay on the part of the government, as various concerned authorities, including Bihar Governor Buta Singh, had to be consulted before making the appointment. “It took a little time as the Prime Minister was also on foreign tours,” he said, adding that the delay was mainly caused due to the rejection of the transfer of former Punjab and Haryana High Court Chief Justice B. K. Roy to Patna High Court by the President because he belonged to the state. Justice Roy had since been transferred to Gauhati High Court. The Supreme Court had last week sought the comments of Union Government why Patna High Court had been headed by an acting Chief Justice for about a year after a public interest litigation to this effect was moved before it. As asked about the appointment of Chief Justices of Rajasthan, Andhra Pradesh and Sikkim High Court, which were also headed by acting Chief Justices, Mr Bharadwaj said recommendations about it were still awaited from the Supreme Court Collegium. The Law Minister admitted that the High Courts of Punjab and Haryana and Madras were “the problem areas” so far as the appointment of judges was concerned. Mr Bharadwaj also said the position in High Courts of Bombay, Delhi and Allahabad had improved considerably with the appointment of new judges. A decision to this effect was taken at a high-level meeting chaired by Union Home Secretary V.K. Duggal with the Directors-General of Police and Chief Secretaries of Assam, Nagaland, Tripura and Meghalaya here today. The first meeting of the joint intelligence group will be organised by the Director General of Police (DGP) of Meghalaya at Shillong soon and subsequent meetings will be held every three months on a rotational basis by the other state DGPs,” Mr Duggal told newspersons after a three-hour meeting at North Block. Replying to questions on the joint intelligence sharing mechanism, the Home Secretary said such a system would help check efforts by militant groups like ULFA in Assam, ATTF in Tripura, NSCN in Nagaland and the NDFB of Bodos to join hands. He maintained that though the Centre was working towards achieving political solutions to problems in the North East, the need of the hour was to address issues relating to militancy. He said, the Centre was also maintaining a close vigil on problems between Garo and Khasi tribes. The Home Secretary is understood to have also directed the Assam Chief Secretary and Director General of Police to maintain close watch on the fallout in the state following the Supreme Court’s order scrapping the controversial Illegal Migrants Deportation by Tribunals Act. Sources said the Centre has received reports about polarisation among political parties and groups in Assam following the apex court verdict and that Central agencies were keeping a close watch on the evolving situation in the state. On the blockade of national highways leading to Manipur by Naga students in the recent past, Duggal said while the blockade has been lifted, Assam and Nagaland governments had assured the Centre that they would provide adequate police protection to truck drivers to ensure essential commodities reached Imphal. Mr Duggal said he would hold in about 10 days time another meeting of Chief Secretaries of Manipur, Arunachal Pradesh and Mizoram here. While Manipur was invited for the high-level meeting, it failed to send its representatives, sources said, adding that the Union Home Secretary will be convening another meeting to discuss Manipur’s problem in the next 10 days. At a time when the country is facing power shortage, partly due to inadequate coal supply, the new wage agreement is expected to help the country increase in coal production. The National Coal Wage Agreement was signed by the Joint Bipartite Committee for Coal Industry (JBCCI) comprising the Coal India Limited (CIL) management and representatives of the five central trade unions. Meanwhile, five central trade unions have urged the government to accord infrastructure industry status to the coal sector and demanded financial assistance for restructuring the BCCL and the ECL. “The government has not accorded the status of infrastructure industry to the coal sector. If the said status was accorded to coal sector then the problem could be solved,” CITU President M. K. Pandhe told reporters after the signing of the agreement. He asked the government to explore the possibility of extending financial assistance to the Bharat Coking Coal Ltd (BCCL) and the Eastern Coalfields Ltd (ECL), which had been declared sick and whose cases for revival were pending with the BIFR. The minimum wages after revision in the NCWA VII had been fixed at Rs 6,205 and the maximum at Rs 13,652 as against the minimum of Rs 5,019 and maximum of Rs 12,031 respectively in the earlier agreement. The NDMA will coordinate the enforcement and implementation of the policies and plans for disaster management and arrange for as well as oversee the provision of funds for preparedness and quick response in any eventuality, PM’s media advisor Sanjaya Baru said here today. The NDMA can also frame guidelines for the minimum standards of relief to be provided to persons affected by disaster and give directions regarding relief through loan repayment or provide fresh loans on concessional terms as deemed appropriate. Dr Baru said the NDMA might also take measures for the prevention of disaster coupled with mitigating its effects and facilitate capacity building for dealing with a threatening disaster situation or disaster. Besides the Prime Minister, other members of the NDMA are former Chief of Army Staff, Gen N. C. Vij, who will be the Deputy Chairman, former director of IIT, Mumbai, Prof S. P. Sukhatme, former CISF Director-General K. M. Singh and former Andhra Pradesh Minister for Environment M. Sashidhar Reddy. The NDMA will be serviced by the Union Home Ministry. The Defence Minister, who was here in connection with a ceremony held to hand over nine upgraded Jaguar aircraft and one pilot-less aircraft Lakshya to the Indian Air Force by the Hindustan Aeronautics Limited (HAL), said this also proved that whatever improvement had occurred in the security environment in Jammu and Kashmir was due to the vigilance of the armed forces and not due to any restraint exercised from across the border. Giving details of the infiltration during an interaction with the media, he said it had been reported two days back that the infiltrators had crossed the Line of Control in an area, which had a very daunting terrain. However, Mr Mukherjee said the infiltrators were challenged and a firefight ensued. He said simultaneously the armed forces had started a process of encircling the militants. The Defence Minister said, according to a report given to him by the Chief of the Army Staff, eight bodies of militants had been identified at the site of the encounter. He said there were more militants in the area. “I do not think anyone will be able to escape,” he added. Stating that the Union Foreign Minister had given the exact location of the camps being used by infiltrators to his Pakistan counterpart, Mr Mukherjee, however, stated that the latest aggression would not hamper the peace process. “This is the psychology of the militants. Whenever normalcy returns, they try to disrupt the peace process. We should not fall into the trap and the peace process should continue”, he added. He also said the procurement of 126 multi-role aircraft was delayed but that the process was still on. Earlier, while speaking at the ceremony which involved handing over the aircraft to IAF chief S. P. Tyagi, the Defence Minister said the nation must equip itself for electronic warfare. He added the manufacture of pilot-less aircraft was a step in this direction. He said more stress needed to be laid on developing advanced technology. Mr Tyagi said the integration of the Darren Two system in the upgraded Jagaurs of which the Air Force received nine from the HAL was a noteworthy step towards self-reliance. HAL Chairman Ashok Baweja said the MIG -27 and Sea Harrier would be upgraded next. Karnataka Chief Minister N. Dharam Singh also spoke. “We have sought views of the Bar Council, lawyers and others concerned. We will examine the issue and notify the law only after it,” Law Minister H R Bharadwaj told mediapersons at a press conference here. The lawyers had opposed the amendments pertaining to anticipatory bail and test identification parade proceedings, describing them as affecting the rights of accused to defend themselves in the court of law. On the issue of IMDT Act struck by the Supreme Court, the UPA government which had favoured retention of the law in its submission before the court during arguments, took an entirely different stand with the Law Minister admitting that the Law had not delivered the desired results. Stating that the Union Government would not seek review of the verdict, he said the matter had been discussed with Assam Chief Minister Tarun Gagoi and efforts would be made to take everyone into confidence. “We are not in the favour of filing a review in the Supreme Court,” Mr Bharadwaj said. But the Law Minister did not agree with the strong observations made in the verdict that huge influx from Bangladesh amounted to “external aggression”. “I don’t go into these things, the final verdict of the Supreme Court is that the law has been declared ultra vires,” he asserted. He also said the Bill on the setting up of a committee to inquire into allegations against judges has been sent to Chief Justice of India R.C. Lahoti for seeking his views. “The Chief Justice has said that he will consult his colleagues and get back to the government,” Mr Bharadwaj said, adding that he was in the process of consulting the Bar Council and others concerned on the issue. Asked whether the government would initiate a debate on the issue of “tainted ministers” in the coming monsoon session, especially in the view of the matter again being raised today in the Supreme Court, which has sought comments of the Attorney-General, Mr Bharadwaj said the UPA government was never averse to discussing it. The Bench, comprising Chief Justice R. V. Raveendran and Justice S. S. Khemkar, issued the directive yesterday on a PIL filed by Mr Alok Pratap Singh of the Bhopal Gas Peedit Sangathan and others.